Meanwhile add only the leaf of the silverbeet and spinach into a colander. Wash thoroughly and place over pot of cooking pasta. Steam for approx. 15min until soft to touch. Place cloves of garlic onto baking tray and roast at 180°C for 15-20min until soft. Add to a pan a teaspoon of olive oil and cook the whole chicken breast on both sides at a medium heat. Tip: Helps to place a large lid over the pan to help it cook through. Place silverbeet, spinach, garlic, basil, olive oil, almonds, salt and pepper into a food processor. Blend until roughly smooth adding extra olive oil to help and salt and pepper to taste. Place cooked chicken on chopping board. Using a fork, pull the flesh so you are left with shredded chicken. Place asparagus into pan and lightly fry for 5min. Add to pasta your pesto, chicken and stir through thoroughly. 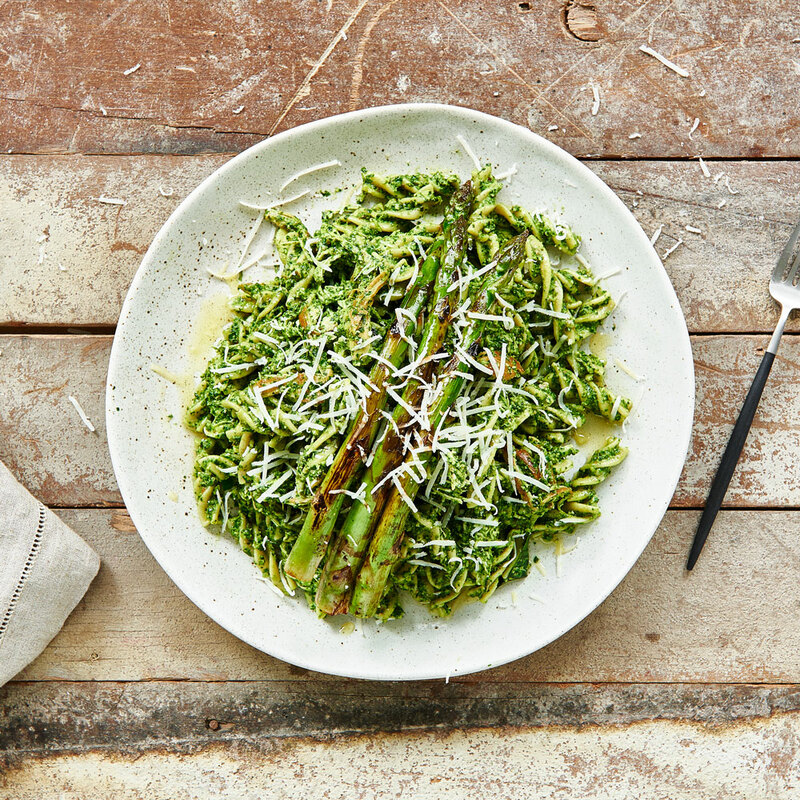 Serve with parmesan and top with asparagus.